Every year during the Durga Puja, many films release and a competition begins between the high voltage films. Many Bengali films will release in this Durga Puja and brief description of the films are given below. Film Byomkesh O Agniban is based on Agniban and Upasanghar written by Sharadindu Bandyopadhyay. and the film is directed by Anjan Dutta. Producer of the film is Kaustav Roy. Film Projapoti Biskut is the second film of Anindya Chattopadhyay and after Open Tee Bioscope, expectations on Anindya has increased. This film is based on comedy of errors in the lives of a newly married couple. Projapoti Biskut is presented by Nandita Roy and Shiboprosad Mukherjee. Many newcomers will be seen in this film. Dev, Koel Mallick and Rukmini Maitra have come together for Dev’s home production, Cockpit. 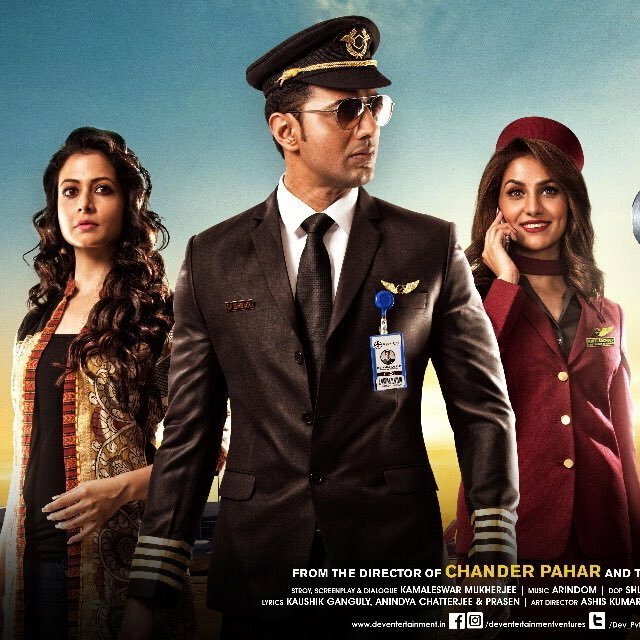 Dev plays the pilot of an aircraft hit by turbulent weather while flying Mumbai to Calcutta. The film shows how the pilot lands the craft even as two engines stop functioning. Rukmini is an air hostess and Koel is Dev’s love interest in the film Cockpit. Film Cockpit is directed by Kamaleswar Mukherjee.